Combine the cake mix, water, oil, and eggs for 30 seconds on low. Then, beat on medium for two minutes. Bake at 325°F for 45-55 minutes, or until a toothpick inserted in the center comes out clean. Cool cakes in the pans, on a wire rack, for 30 minutes. Remove the cakes from the pan and cool completely on a wire rack. Use a long, serrated knife to cut off the rounded tops when ready to decorate. Heat cream in the microwave until it just begins to boil. Stir in the hot chocolate mix until dissolved. Place in the fridge to cool before making the buttercream. Beat the butter and shortening for 2-3 minutes until light and fluffy. Beat in the marshmallow cream and vanilla. Add the powdered sugar one cup at a time. Start on a slow speed until combined and then beat until smooth. Add the cooled hot chocolate, stir and then beat until smooth. Spread hot chocolate buttercream over the bottom layer of cake. Add the second layer and frost it with more buttercream. Beat the butter and shortening for 2-3 minutes until light and fluffy. Beat in the vanilla. Add the milk and beat until smooth and fluffy. Color with gel paste or your food coloring of choice. Spread a thin layer of buttercream frosting over the sides of the cake to create a crumb coat. Put frosting in a decorating bag and pipe a wide rim of frosting around the top of the cake. This will become the rim of the hot cocoa mug and will hold the ganache in place. Finish frosting the cake and place in in the fridge to chill. Bring the heavy cream just to a boil in the microwave. Add the chocolate chips and let it sit for three minutes. Stir until smooth. Slowly pour enough ganache on the center of the cake that it can cover the top. Spread out with a spatula. 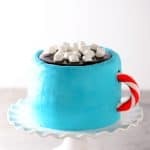 Top with mini marshmallows and insert a candy cane or licorice handle. Hot Chocolate Buttercream recipe adapted from Cookies & Cups.